Their Boston sports bromance was forged out of the limelight amid the mutual pressures of their jobs. 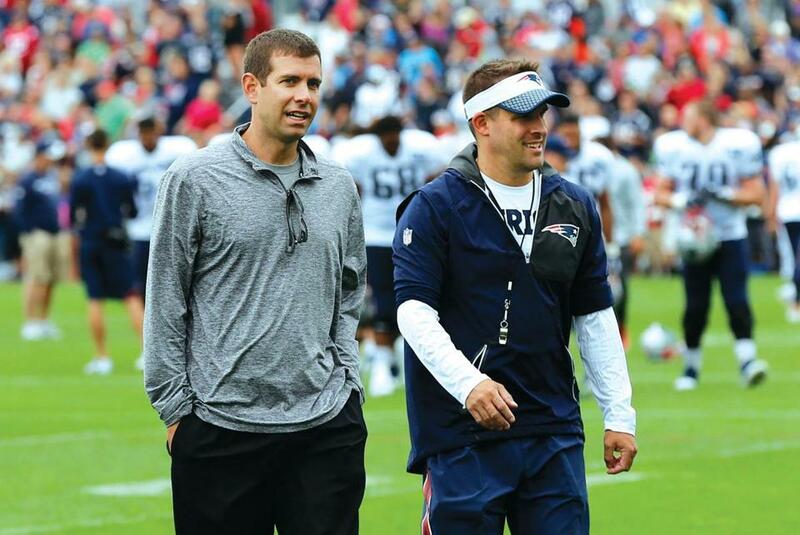 Celtics coach Brad Stevens and Patriots offensive coordinator Josh McDaniels at Patriots training camp in Foxborough in July 2017. Tracy Stevens, the wife of Celtics head coach Brad Stevens, was driving home after a game when the sports commentators on the radio began dissecting Jumbotron appearances by two prominent fans in attendance at the TD Garden that night: New England Patriots head coach Bill Belichick and his offensive coordinator, Josh McDaniels. The hosts joked that while Belichick sat courtside, McDaniels was stuck in the “cheap seats” with the rest of the commoners. The commentators — and sports fandom in general — could be forgiven for not knowing that two of New England’s star young coaches hang out quite a bit when the cameras aren’t trained on them. Stevens, 41, and McDaniels, 42, have six children between them (two and four, respectively) and live 15 minutes apart in Boston’s suburbs. Both families tend to congregate at the Garden, where their wives can chat and the kids can escape to the depths of the arena. McDaniels typically attends about eight Celtics games a year to support his friend. “I love the team, I love the coach, and I love the game,” he says, “so as many times as my wife will let me go, I’ll go.” He catches the rest of the games on TV. The obsession is mutual. Though Stevens hails from the Indianapolis area, he’s a full-fledged New England fan. SPORTS ALERTS: Get the latest sports news, columns, and features on all your Boston sports favorites from the Globe staff. Sign up for e-mail alerts here. So how do two of New England’s most famous coaches like to spend their free time in the offseason together? “Dad stuff” is how Stevens characterizes it. They’ve barbecued with their families, and this summer they managed to squeeze in a round of golf. Josh has visited Brad during summer league play in Las Vegas. Their adolescent sons — 14-year-old Jack McDaniels and 12-year-old Brady Stevens — have crossed paths in spring and summer basketball. Despite the fact that they’re originally from the Cleveland area, the McDaniels family now cheers for the Celtics. This past spring, they attended a couple of playoff games, including Game 7 against the Cleveland Cavaliers. After that defeat, McDaniels sent his friend a sympathetic message, just as Stevens had done for him following Super Bowl LII. 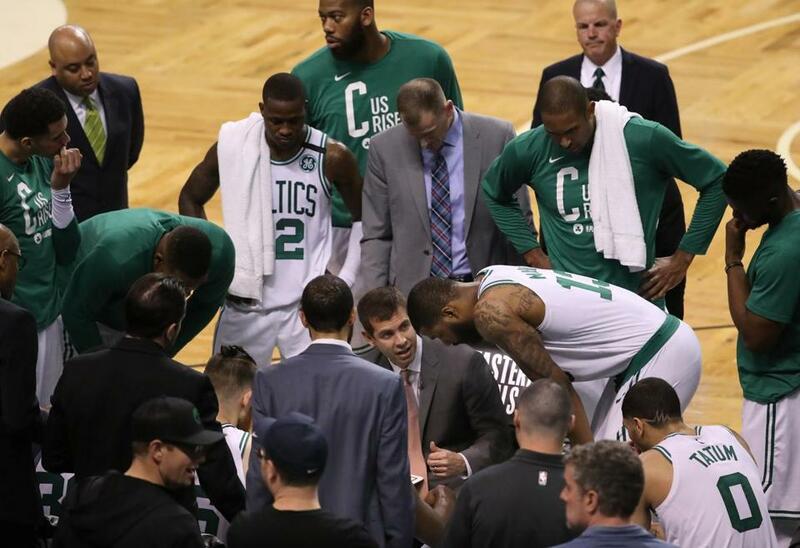 Brad Stevens with his players during a timeout against the Cleveland Cavaliers in Game 7 of the Eastern Conference championship in May. The Celtics lost the game, 87-79. Talk to Stevens and McDaniels for any length of time, and it’s easy to see that they share a similar coaching philosophy and a genuine interest in learning from each other. They maintain a steady stream of conversation through regular phone calls, and their chain of text messages is filled with ideas about how to face hard decisions. They are chasing the legacies of Red Auerbach and Bill Belichick — one memorialized with a bronze statue near Faneuil Hall, the other still carving out his body of work — both among the most legendary coaches in their sports. Now they’re helping each other navigate the sports landscape of New England, where they’re learning to carry the expectations of two dynasties on their shoulders. Neither Stevens nor McDaniels remembers exactly how they first met, but their friendship was sparked by a sense of mutual admiration. Stevens joined the Celtics in 2013, when the Celtics made him the NBA’s youngest coach with a six-year contract that has since been extended. Like so many football fans, he was impressed with the Patriots’ winning culture. Meanwhile, McDaniels had watched closely as Stevens led NCAA underdog Butler University to consecutive men’s basketball title games. He reached out to the new coach in town, and a conversation that started over lunch is still going five years later. 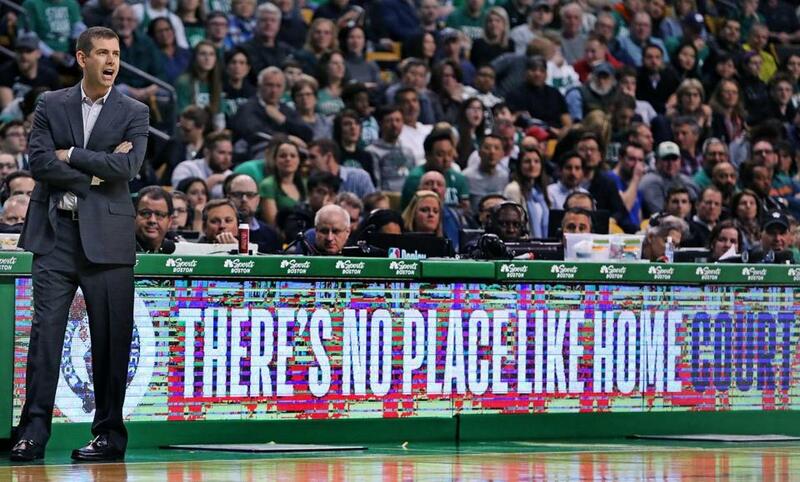 McDaniels assured Stevens early on that New England was a great place to coach and “a tremendous place to raise your family.” That came as a relief to Brad and Tracy, who were concerned about how their children might adjust to growing up in the limelight. SIGN UP: Get the best of the magazine’s stories and features in your e-mail inbox every Sunday. Sign up here. If they weren’t mainstays on local sports programming, McDaniels and Stevens might blend into suburbia. Though still boyish looking, both men give off a pleasant Midwestern-dad vibe. Stevens disguises a fiery competitiveness behind his mild manner on the sidelines and drops dry jokes in conversation, whereas McDaniels strikes a more serious tone, like his father, Thom, a legendary high school football coach. The elder McDaniels believes his son has learned the art of stoicism from Stevens and Belichick — and become a better coach for it. Though Belichick kept his e-mail responses to inquiries about McDaniels characteristically short, he describes his protege as a dedicated and quick study “who got along with everybody and brought a great personality to the staff.” Those who know Stevens describe him much the same way. 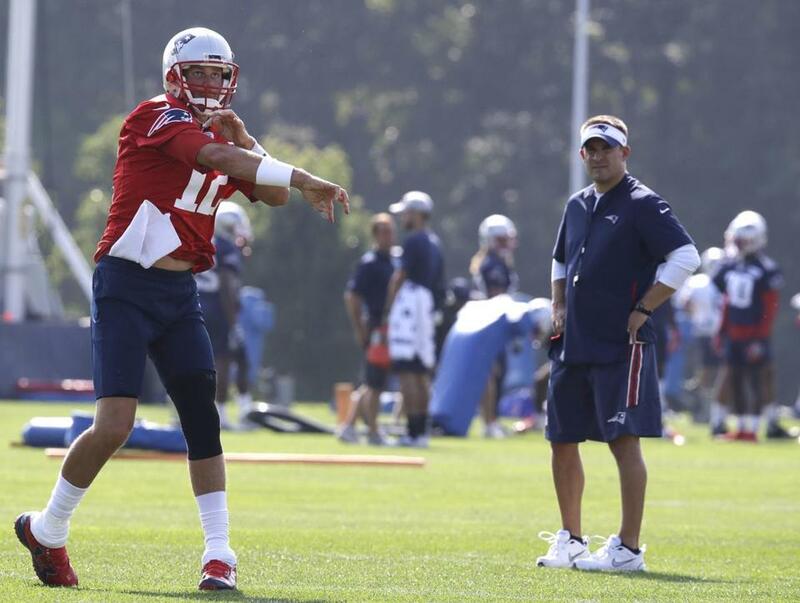 McDaniels with Patriots quarterback Tom Brady during training camp in July. McDaniels grew up watching how his father, a noted high school football coach, worked. McDaniels and Stevens have also bonded over their roots in Canton, Ohio, the town where Josh spent most of his childhood in the shadow of the Pro Football Hall of Fame, which is also where Brad’s mother worked summers in the gift shop during college. Their wives both grew up in and around Cleveland. Stevens enjoyed a childhood in Zionsville, Indiana, seemingly plucked right out of Hoosiers, though he grew up in a subdivision instead of a farmhouse. After half-days of kindergarten, he rewatched VHS tapes of college basketball games — his first film sessions, as it were. When he got a little older, Stevens and his father would join friends at the local Steak ’n Shake to discuss games. Meanwhile, in Ohio, McDaniels started tagging along to practice with his father when he was about 5 years old. Those days turned to high school stardom and Division III careers in football and basketball for Josh and Brad at John Carroll and DePauw universities, respectively. Stevens majored in economics, McDaniels in mathematics. Both accepted entry-level positions at stable companies after college — Stevens as a pharmaceutical marketing associate in Indianapolis and McDaniels as a plastics sales representative in Cleveland. Neither lasted much more than a year before trading their business attire for shorts and a whistle. “Obviously, he’s a basketball coach, and that’s what he was born to do,” McDaniels says of Stevens. Stevens arrives at Patriots practice with pen and paper at least once almost every season, including twice last year. He studies how Belichick runs drills, sits in on the team meeting, and follows McDaniels from film session to film session. Stevens leaves with a full notebook every time, juiced, like a man who might get an endorphin rush from running a mathematical Olympics. If McDaniels and Stevens are young Jedis, Belichick, with his seven Super Bowl rings (five as Patriots head coach, two from his stint with the New York Giants), is their Yoda. Their quest to replicate his success leads every conversation between the two men back to coaching, as they exchange precious morsels of information that might help them take that next step toward the summit. 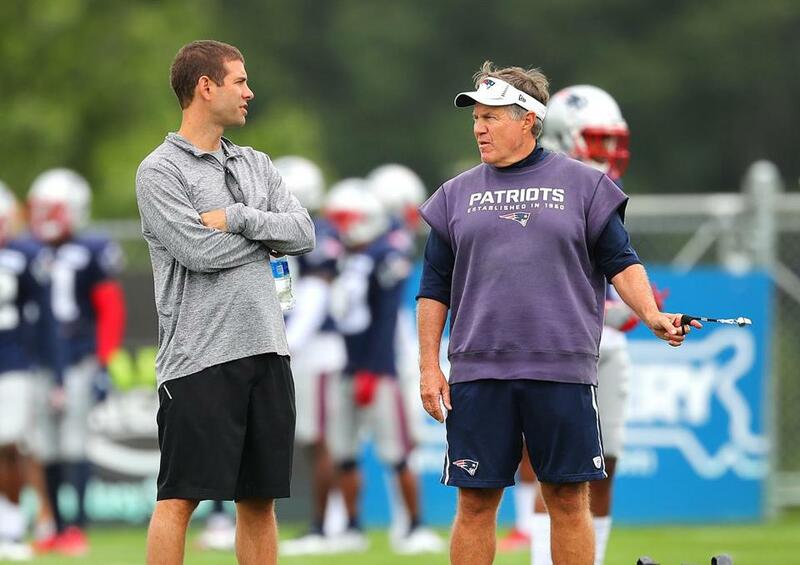 On a visit to Patriots training camp in July 2017, Stevens talks with Bill Belichick. Stevens arrives armed with pen and paper, and takes lots of notes while studying how Belichick runs drills and meetings. In turn, McDaniels also shadowed his friend at Celtics practice before a game against the Indiana Pacers in March and was blown away by how efficient it was. Because of the differences between the two sports, their exchanges tend to focus less on X’s and O’s and more on coaching as a craft — leadership, communication, structure, team building, culture setting. They treat every life experience as a learning opportunity they can apply on the field or on the court. Dressed in a cutoff hoodie and a Patriots hat after a February 4 Celtics win, Stevens held a press conference that lasted just three minutes. “Football game to watch,” he told reporters before rushing home to catch the Super Bowl. One of the topics they obsess over most is how to relate to and keep up with their players — many of whom are part of a younger generation that feels light-years different from their own. 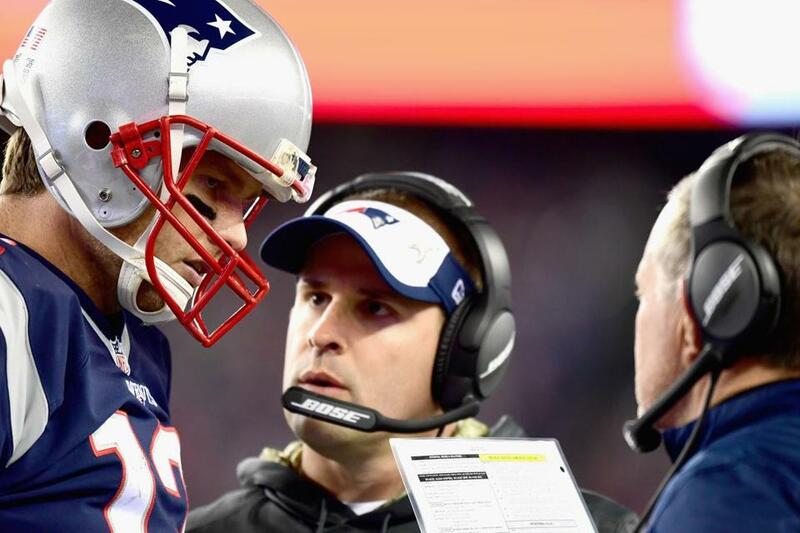 McDaniels helped steward Tom Brady’s evolution from Super Bowl-winning system quarterback to record-setting MVP and, arguably, the greatest player in history. The bond between Brady and McDaniels played a role in the Patriots’ push to retain their offensive coordinator this past February, though McDaniels maintains it was ultimately a “family decision.” It was a move to stabilize a dynasty that appeared to be in turmoil. In February, McDaniels (shown with Brady and Belichick during a 2016 game) changed his mind about taking the head coach job in Indianapolis. Stevens was the first to tell star player Gordon Hayward he had NBA potential when he lured him to play at Butler. Together, they reached the 2010 NCAA title game. The narrative that bound their careers, even as they parted ways, may have been overplayed, but Stevens “was always a phone call away,” says Hayward. And when Hayward visited the Celtics in 2017 free agency, it felt like picking up where he left off with an old friend. Both McDaniels and Stevens finished in the top 10 of their high school graduating classes, and that drive has carried over into their coaching careers. McDaniels was the architect of one of the most prolific offenses in NFL history at age 31, and Stevens was 33 when he shepherded Butler to within inches of an unthinkable NCAA upset. They have been labeled geniuses in some form or another by everyone from fans to their own players to historically great coaches like Tony Dungy and Gregg Popovich. If fans understand anything about McDaniels and Stevens, they know the coaches deflect praise and are quick to credit their players for their teams’ successes, which include 10 conference finals appearances between them as offensive coordinator and head coach, respectively. Their close proximity nearly came to an end in February. Less than 24 hours before McDaniels was about to be introduced as the Colts’ next head coach, he made a dramatic about-face and decided to stay in New England. Stevens says he didn’t talk to his friend very much during that time. For Stevens, the NBA draft and summer league preceded a brief break that will allow him to explore New England and maybe another Patriots practice. For McDaniels, offseason workouts sandwiched an early June mini-camp, and then he traveled in search of more coaching lessons before training camp started in late July. Stevens sometimes wishes he had stopped to smell the roses more often. Ben Rohrbach is a freelance sports writer in the Boston area and a regular contributor to Yahoo Sports. Send comments to magazine@globe.com.